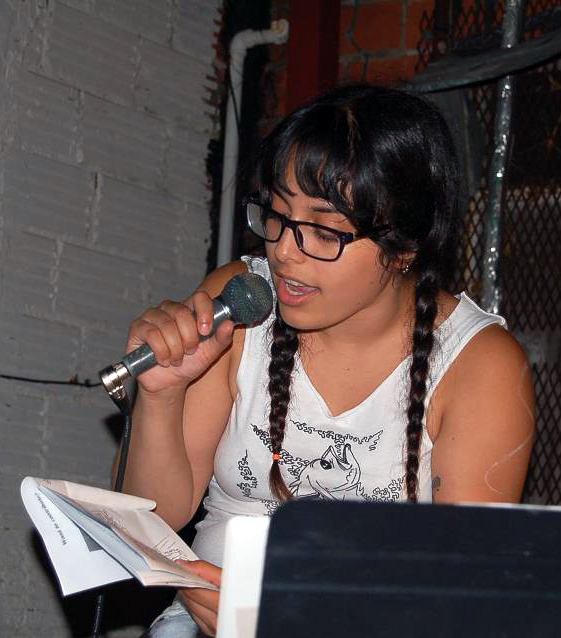 Interview with a Zinester: Suzy Gonzalez! Suzy, wearing long braids and with microphone in hand, reading from one of their zines. Kindly give us a short description of yourself and the work you do. I’m a Chicana-vegan-feminist-zinester from Texas, currently working on my MFA in Painting at the Rhode Island School of Design. I’m invested in the fusing of art and activism, declining socially constructed binaries, and being critical of institutional injustices. I make paintings, sculpture, prints, intallations, etc., but zines are the only way I am able to truly get my political opinions across. My zines consist of personal accounts, drawings, current events, and interviews with those whom I admire and respect, and are generally related in some way to my identity. I’m excited to be presenting my first comic this year that reflects on being a woman of color in an elite institution while attempting to make art that calls for social change. How did you get introduced to zines? Were you influenced by anyone? What does it mean to do “feminist zine-making”? Does feminism appear in your work (explicitly or implicitly)? It will appear in all of my work for the rest of my life, and I couldn’t be happier about that. It is entirely explicit. Art snobs hate that, and I don’t care. To make a feminist zine or a feminist painting is to express ones voice–a voice that refuses to be silenced. What is your favorite zine or piece of mail art? Do you like any specific style/part of a zine? I’m drawn towards feminist compilation zines because I’m all for feminists supporting feminists, and enjoy reading personal stories, like those found in Tenacious: Art and Writings from Women In Prison or This is Me Using My Choice: An Anthology of Women’s Abortion Stories. It’s great to see so much support towards those who want to share their stories. It’s more of a chapbook, but I also love Arise, Chicano! and other Poems by the late Angela de Hoyos. It’s a bilingual read and reminds me of the complications, yet pride I have in my own identity. I’m also really into Evolution of a Race Riot, edited by Mimi Thi Nguyen, which has reprints of writings from the 90s and accounts from POC on riot grrrl and punk rock. It shines a light on a reality that I was unaware of as a kid, but allows me to relate to these writers as an adult. I’m able to see how much has changed and how much hasn’t. I guess I like to think of my zine collection as a historical archive. If you could sum up your zinester life in a kitchen appliance, what appliance would it be? Hmm, maybe a tea infuser, because I like to spread my ideas around. Finally, who are some of the other zinesters you’re excited to see at this year’s feminist zine fest? It was great to see Hoax zine last year. Hoax Issue #5 on Community came into my life at a really great time, and I’m looking forward to what seeing what they’ve been up to this past year. I’m also way into Annie Mok’s comics. Previous Previous post: Interview with a Zinester: Anna Melton!